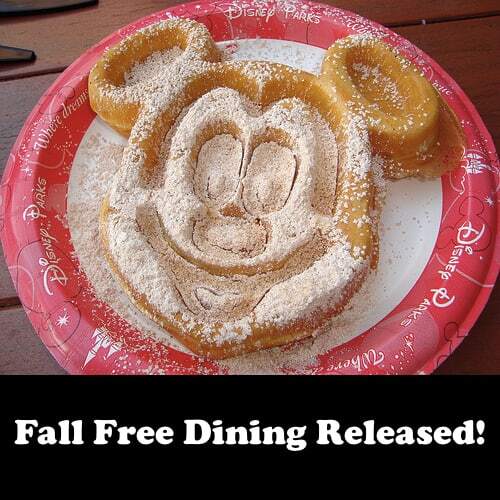 Fall Free Dining Released by Disney!! * Select Disney Value Resorts will offer the FREE Quick Service Dining Plan and Select Disney Moderate, Deluxe and Deluxe Villa Resorts will offer a FREE Disney Dining Plan. Excludes campsites, 3 bedroom Villas and Art of Animation – Little Mermaid Rooms. Excludes gratuity and alcoholic beverages. Rooms are limited and will fill up quickly so you’ll want to make your reservations soon. If you do not have a travel agent, you can contact our sponsor Kingdom Konsultants on the web at www.KingdomKonsultants.com or by phone at 1-866-566-7858.